Transform the stability of your aircraft and fly like a Pro with the Detrum iStone-All V2 airplane stabilizer. The stabilizer utilises a 6-axis sensor chipset that includes a high performance Gyro and Accelerometer to help control your aircraft and provide true wing leveling capability to aid recovery from lost orientation. In gusty conditions, the iStone-All V2 will perform thousands of calculations a second to make corrections much quicker than a human pilot can and allow you to fly like it's a perfectly calm day! If you are a beginner pilot, the iStone-All V2 can help take the fear factor out of the first few flights. If you get into trouble, just let the sticks go and the iStone-All will attempt to quickly bring your model back to straight-and-level flight. If you are flying a plane that is not very stable due to imbalance, poor aerodynamics or high motor torque, the stabilizer can make things much easier. If you are a more experienced pilot, the iStone-All V2 can give you the confidence to practice more risky maneuvers knowing that you have the ability to rescue your aircraft into the Safe Mode at the flick of a switch. It also has a dedicated Aerobatic Mode, which makes your plane snappier for precision maneuvers and can lock its attitude to simplify complex stunts. Whether you fly petrol or electric models, wings, foamies, sailplanes, or just about any other fixed wing model, the Detrum iStone-All V2 is for you. It weighs only about 10grams, and has a tiny footprint, so it is perfect for most models, from small foamies and up. 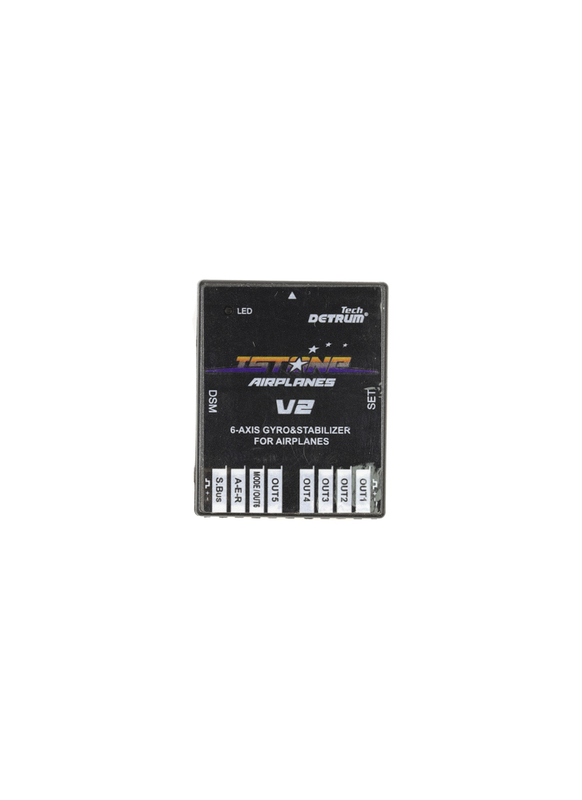 It supports normal wing, delta wing and V-tail model aircraft and can control up to 6 servos. It's compatible with most radio control systems, including PWM, SBUS and DSM receivers. Finally, setup is made easy via the portable 3-1 programmer (purchased separately). Gyro Off Mode (OFF): Choose this mode to disable the gyros for all channels. 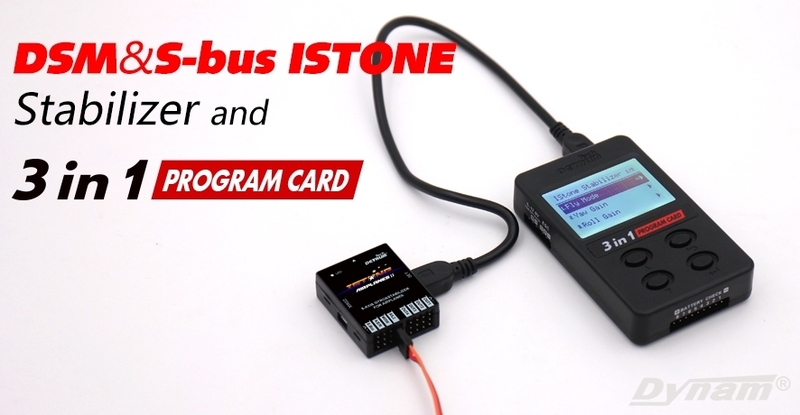 The airplane will be completely under the control of your transmitter inputs, acting the same as it would without the ISTONE-All V2 installed. Normal Mode (Normal): In this mode, the gyro will sense angular velocity on each axis and make momentary reactions to improve the stability of your airplane. The normal mode is suitable for all types of airplane and useful in windy conditions. Auto-Recovery Mode (Safe): When operating in this mode, the airplane will maintain level flight automatically. You can switch into this mode in an emergency to restore your aircraft to straight-and-level flight. This mode is suitable for the new beginners or the FPV (First Person View) applications. Aerobatic Mode (Aerobatic): This mode holds and maintains your aircraft at a given attitude set by the last command sent from your transmitter, helping you to accomplish stunts like prop hanging, inverted flight, knife edges, low speed harriers, etc! Why use an airplane gyro? - Gyros (also called flight stabilizers) help keep your airplane stable during take-off, flight maneuvers, and landings which can be helpful during windy days or when learning how to fly RC planes. Once thought to be for beginners only, Gyros are now common in all classes of aircraft and are utilised by all levels of flyers. Gyros are great for learning, they let pilots practice advanced aerobatics, they give you piece of mind in less than ideal flight conditions, and they can often help you avoid costly crash damage. im a bit puzzled by the various types does this on haveABS ? ABS (Auto Balance System) - yes this stabilizer has various stability modes which you can change between remotely via your RC.